Chalk one up for the United States-Mexico-Canada Agreement (USMCA)? Amid news that the US and Canada had hammered out their differences and a new (improved, with lemon-fresh scent!) trade agreement would become a reality, the US stock market opened the week with a bang yesterday. The Dow Jones Industrial Average (DJIA) jumped nearly 300 points in early trading and, like the S&P 500 (SPX), traded to its highest level since its September 21 record peak. Bulls may understandably see a longer-term breakout unfolding, but despite the new high milestone, yesterday’s price action may have given some traders pause about jumping on the bandwagon immediately. 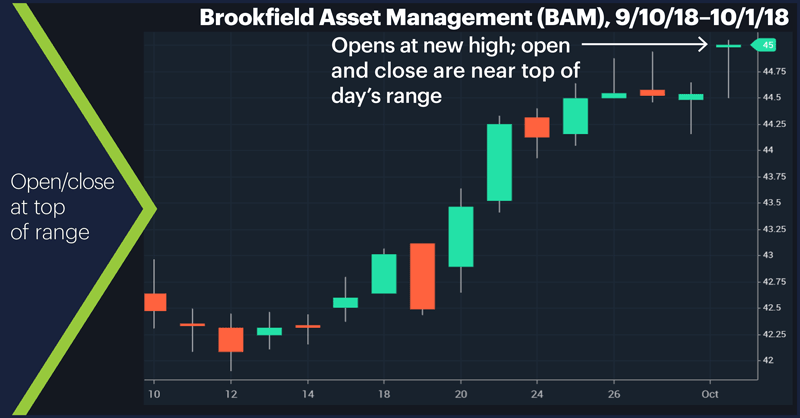 Look again at the first (daily) chart and you’ll notice that soon after opening at a new high, the stock dropped around 1% intraday (to $44.49) before trading back up near the top of its range. ●After five days the stock was lower 58% of the time and had an average loss of -0.9%. Also, the higher the open and close were in the day’s range, the more bearish the short-term outlook (although there were fewer examples to draw from). In other words, despite the seemingly bullish action on such days—a strong open and a higher high—the stock tended to pull back after them, at least in the short-term. The stock’s had a high-momentum run recently, and yesterday it squeezed itself into the upper portion of its range amid friendly news about US-Canadian trade conditions. There’s no disconnect between a longer-term uptrend being intact and the possibility of a short-term give-back. Momentum ebbs and flows—that’s how markets roll. Market Mover Update: The Nasdaq 100 (NDX) traded above 7,700 for the first time yesterday, hitting a new all-time of 7,700.56 before pulling back. Today’s numbers (all times ET): Eurozone PPI (5 a.m.), Motor Vehicle Sales. 1 IPE.com. Top 50 infrastructure investment managers 2018. July/August 2018. 2 StreetInsider.com. 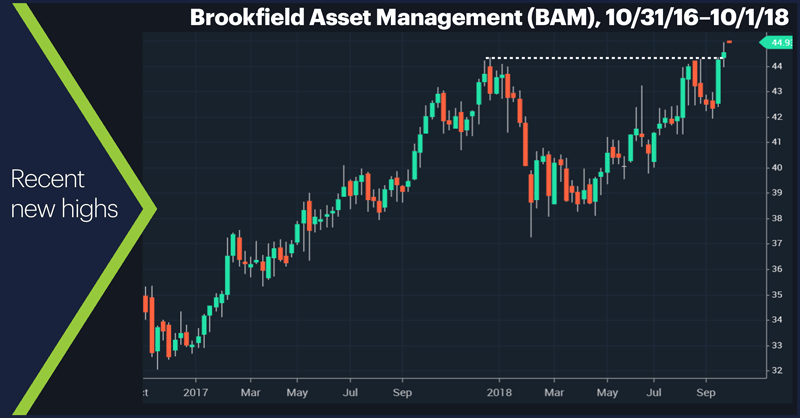 Brookfield Asset Management. 10/1/18.